Desert Vista Village is a beautiful 55+ community in Yucca Valley, California. This active adult neighborhood began development in 2011 and upon completion will contain 105 beautiful single-family homes in the classic Southern California style. Homeowners within Desert Vista Village will also enjoy a well-equipped clubhouse that is brimming with amenities and acts as the social center of the community. Desert Vista Village also attracts active adults who love the Old West aesthetic, playing host to numerous museums and unique attractions. Desert Vista Village combines modern active adult living in a historical Southern California setting. Desert Vista Village has a centrally located clubhouse where homeowners stay physically fit and socially active. An exercise room lets residents stay in shape without the hassle of a gym membership. Staying in touch with neighbors is easy thanks to the meeting room, billiards room, card tables, and catering kitchen. 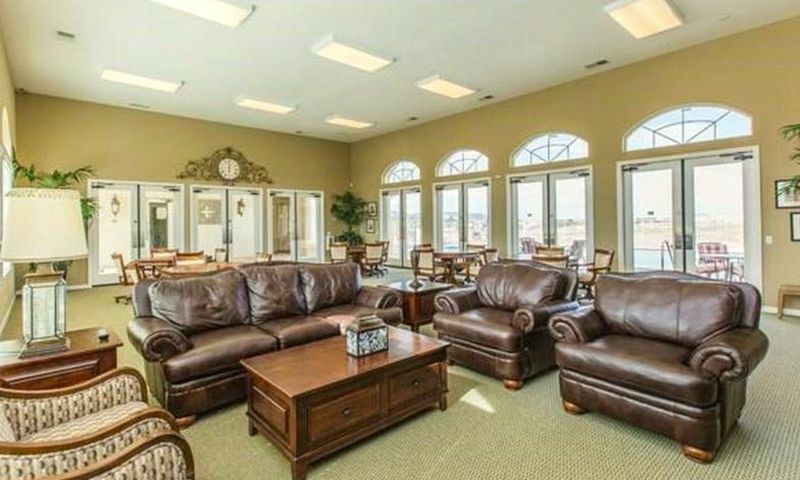 The clubhouse also has computer access for catching up on emails. The terrific amenities continue outdoors with amenities sure to keep homeowners busy. There is a beautiful pool, spa, and patio for soaking in the Southern California sun. Enjoy some friendly competition with two bocce ball courts and a nine-hole putting green. A BBQ area is perfect for a casual afternoon with neighbors, while walking and biking trails are a scenic way to diversify your exercise regimen. For homeowners' convenience, Desert Vista Village has an R.V. parking area. There are three plans available within Desert Vista Village. These homes range in size from 1,241 to 1,501 square feet and offer two bedrooms, two or two-and-a-half bathrooms, and an attached two-car garage. Built to maximize efficiency, the homes within Desert Vista Village contain energy-efficient vinyl windows, fluorescent lightbulbs, Solar Voltaic systems, and low-flush toilets. Residences also have stylistic flourishes like stainless-steel appliances, granite countertops, and private courtyards in each home. Life in Desert Vista Village is one of leisure with like-minded neighbors. Residents frequently mingle over a game of billiards or bocce ball. Join a game around the card tables or pitch in for a community BBQ. No matter how you like to spend your time, Desert Vista Village will give you the opportunity to do it. Desert Vista Village is located near Palm Springs, CA. Residents will find everything they need just around the corner on Twentynine Palms Highway, including grocery stores, fast food restaurants, banks, a movie theater, and health centers. Route 62 is just outside the community for getting around the region while Palm Springs International Airport is just over 30 miles away. Palm Springs, attracting thrill seekers and high-end vacationers alike, is just a half hour's drive away. Closer to home, residents have Big Morongo Canyon Preserve, San Bernardino National Forest, and Cleghorn Lakes Wilderness Area nearby. Yucca Valley is also home to several antique stores, an outdoor marketplace, as well as a wine tasting room all in Yucca Valley. Active adults seeking an adventure will love life in Desert Vista Village in Southern California. There are plenty of activities available in Desert Vista Village. Here is a sample of some of the clubs, activities and classes offered here. I have lived in Desert Vista Village since October 2016 and this was my first HOA ever but I must say, its a great community and as for the HOA fee, its the lowest I have seen even at the Mobile Home Parks here in town. I am very happy here and I would recommend this community very highly. Beautiful, small community...nice clubhouse and attractive new homes. Overall, good value in Yucca Valley! 55places.com is not affiliated with the developer(s) or homeowners association of Desert Vista Village. The information you submit is distributed to a 55places.com Partner Agent, who is a licensed real estate agent. The information regarding Desert Vista Village has not been verified or approved by the developer or homeowners association. Please verify all information prior to purchasing. 55places.com is not responsible for any errors regarding the information displayed on this website.